With #JustDelicious bacon in the crust and a rich, indulgent cream cheese filling, these zesty cheesecakes are the best way to end a perfect picnic! In a hot pan, fry the bacon cutts until crispy. Remove the bacon from the pan and cut into smaller pieces. In a small bowl, add the melted butter, bacon pieces and ginger to the digestive biscuits and mix well to combine. Line 8 individual moulds (large ramekins or recycled tuna tins) with baking paper and grease well. Spoon the crust into the moulds and press down with the back of a spoon to form an even base. Transfer to the fridge to set. Add all of the ingredients in a large mixing bowl and mix well with a wooden spoon until a smooth batter forms. Remove the crusts from the fridge and pour in the batter, taking care to divide evenly. Place the small cheesecakes on a baking sheet in the oven, reduce the heat to 100°C and bake for 30 minutes. Turn the oven off, leaving the cheesecakes inside to cool down. Transfer the cheesecakes to the fridge to set. 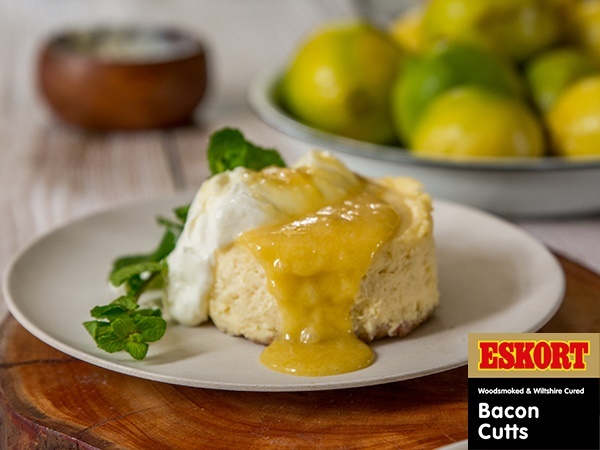 Remove the cheesecakes from their moulds and serve with a spoonful of vanilla yoghurt, lemon curd or caramel.